Edible seeds first mentioned in the Old Testament in Gen. xxv. 29-34, where it is related that Jacob gave Esau "bread and pottage of lentils" for his birth-right. Lentils were also among the provisions brought by Barzillai to David when the latter was in exile (II Sam. xvii. 28); and they seem to have been, as at present in Palestine and in other countries, a common article of food (comp. ib. xxiii. 11). From Ezek. iv. 9 it appears that in times of scarcity lentils, ground and mixed with other ingredients, were made into bread, a practise still in vogue in modern Egypt. 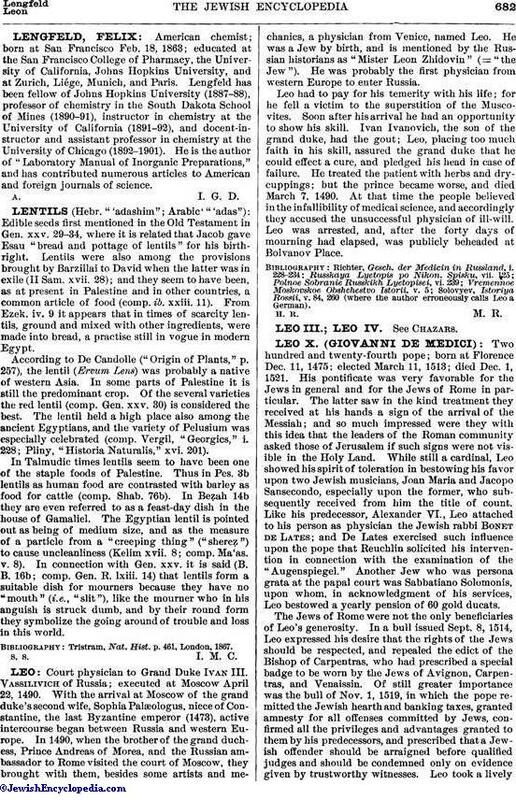 According to De Candolle ("Origin of Plants," p. 257), the lentil (Ervum Lens) was probably a native of western Asia. In some parts of Palestine it is still the predominant crop. Of the several varieties the red lentil (comp. Gen. xxv. 30) is considered the best. The lentil held a high place also among the ancient Egyptians, and the variety of Pelusium was especially celebrated (comp. Vergil, "Georgics," i. 228; Pliny, "Historia Naturalis," xvi. 201). In Talmudic times lentils seem to have been one of the staple foods of Palestine. Thus in Pes. 3b lentils as human food are contrasted with barley as food for cattle (comp. Shab. 76b). In Beẓah 14b they are even referred to as a feast-day dish in the house of Gamaliel. The Egyptian lentil is pointed out as being of medium size, and as the measure of a particle from a "creeping thing" ("shereẓ") to cause uncleanliness (Kelim xvii. 8; comp. Ma'as. v. 8). In connection with Gen. xxv. it is said (B. B. 16b; comp. Gen. R. lxiii. 14) that lentils form a suitable dish for mourners because they have no "mouth" (i.e., "slit"), like the mourner who in his anguish is struck dumb, and by their round form they symbolize the going around of trouble and loss in this world. Tristram, Nat. Hist. p. 461, London, 1867. S. S. I. M. C.